Peter Lello and B4C presenting to Whites Hill State College students at a planting event. 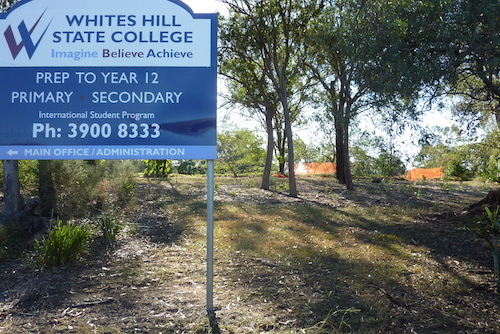 We have been working with Whites Hill State College School and the P&C for several years. The work has involved mainly on-ground revegetation projects, including the current Whites Hill to Oates Hill Squirrel Glider Corridor. This has been possible by the generous guidance and work of Peter Lello (P&C). We have about 1000 plants established in the College and across Samuel Street at Bill Hewitt Park (southern oval area). Much of this work is funded by a Queensland State Government Everyone’s Environment Grant. B4C has contributed in-kind support, including maintenance, labour, extra plants and the like. We’ve been working hard on the next stage which will bring about excellent education, community and environmental benefits. 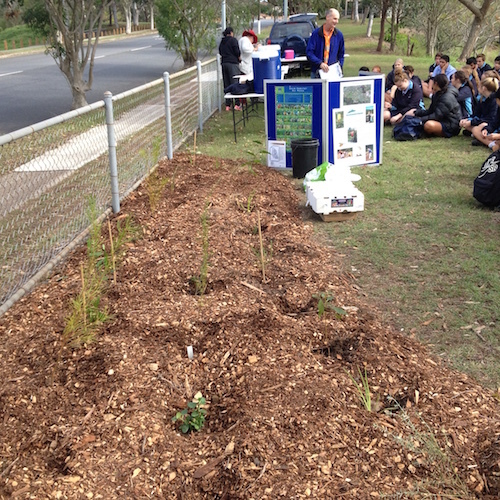 Plantings – planned for later in the year – 600 native tubes in student plantings, with B4C assistance and maintenance. Nest boxes (targeting Squirrel Glider and Scaly Breasted Lorikeet) – 10 boxes to be established. Nest boxes funded by the Federal Government Stronger Communities Grant. Extending nth/sth corridor at Bill Hewitt by clearing and mulching – another 100 cu m.
Extending College oval edge planting areas by 400 sqm. Nest box monitoring program: Stefan Hattingh will lead a team to do this and it will include all Bulimba Creek nest boxes on Council lands. Sub-Catchment excursion for college students – targeting the Salvin, Spring and Phillips Creek corridors. B4C Sponsorship of the College’s fledgling Environment Club. Bursaries – for science/environmental achievement – year 9 and 12. To be presented at School Presentation evening. Volunteer supervision support for Wednesday afternoon environment outdoor program. One of the planned landcare activities is this Tuesday 4 April 9am at Whites Hill State College. We’ll be assisting students from the vacation care program in weeding and mulching within the school grounds. Those wanting to help can RSVP to B4C office by 3 April, 4pm. B4C’s Catchment Manager Wayne Cameron said he’s very pleased with what this project has already achieved as well as the plans for the future. “This is ambitious, and I want the community to know that their work, support and involvement makes this possible,” Wayne says.